Baronagium Genealogicum: or the Pedigrees of the English Peers, Deduced from the Earliest Times, of which there are any Attested Accounts including, as well collateral as lineal descents. Originally Compiled from the Publick Records and most Authentic Evidences; by Sr. William Segar ...; and Continued to the Present Time, by Joseph Edmondson - Sir William Segar, Joseph Edmondson 1764-84 - Engraved and printed for the author, London - First Editions	The most beautifully illustrated and comprehensive record of 18th century Heraldry. A magnificent and extremely rare complete set of six large uncut folio volumes, with 658 copperplate engravings (104 of which are double page) many by the master engraver Francesco Bartolozzi a founder member of the Royal Academy. The plates consist of 279 coats-of-arms (3 double-page), 364 genealogical tables (101 double-page), six titles, six dedication pages, and three specific family dedication pages. Ranked to begin with Royalty, this massive work took 20 years to produce, making it necessary to publish a supplement with new peerages. Provenance - Sir John Smith, Bart., F.R.S. of Sydling St.Nicholas, Dorset, whose initials JS are gilt-stamped to the morocco spine labels and engraved bookplates to the front pastedowns. 'As a book of general reference, one of great utility [with] arms finely engraved' - Lowndes. In addition to the engravings, there are ten letterpress pages of index & list of subscribers at end of volume IV and four letterpress pages of index with list of subscribers at end of the supplementary volume VI. Sir William Segar [C.1554-1633] entered the College of Arms under the patronage of Sir Thomas Heneage in 1585, appointed Garter King of Arms, in 1607 and knighted in 1616. In 1586 Robert Dudley, Earl of Leicester, persuaded him to act as master of ceremonies at the Earl's observance of St George's Day in Utrecht, and in 1596 he accompanied Gilbert Talbot, 7th Earl of Shrewsbury, to Rouen for the investiture of Henry IV of France with the Order of the Garter. Segar published Booke of Honor and Armes in 1590 and the expanded and illustrated version Honor, Military and Civill in 1602. Joseph Edmondson [1732-86] began studying heraldry and genealogy whilst employed to emblazon coats of arms of carriages for the Queen and other nobility in London. 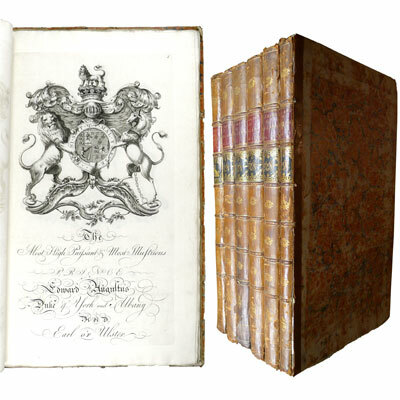 Edmondson acquired the collection of pedigrees originally assembled by Sir William Segar, brought them up to date and published them as the Baronagium Genealogicum. This attracted the attention of the nobility who employed him to compile their family pedigrees. Edmondson was subsequently installed as Mowbray Herald Extraordinary and appointed to the College of Arms. References: Brunet V 259. Lewine 166. Lowndes I 715. Six volumes. Folio (50 x 31 cm). Volume I. 1 title, 2 dedication pages, 31 armourial plates, 47 genealogical tables, 11 double page genealogical tables. Total 103 leaves. Volume II. 1 title, 1 dedication page, 43 armourial plates, 66 genealogical tables, 9 double page genealogical tables. Total 129 leaves. Volume III. 1 title, 2 dedication pages, 47 armourial plates, 1 double page armourial plate, 45 genealogical tables, 23 double page genealogical tables. Total 143 leaves. Volume IV. 1 title, 1 dedication page, 45 armourial plates, 21 genealogical tables, 36 double page genealogical tables. Total 140 leaves. Volume V. 1 title, 1 dedication page, 51 armourial plates, 1 double page armourial plate, 31 genealogical tables, 19 double page genealogical tables. + ‘Supplement’: 1 half title, 1 dedication page, 1 armourial plate, 1 double page armourial plate, [9 Index] [1 subscribers]. Total 133 leaves. Volume VI. 1 title, 1 dedication page, 58 armourial plates, 53 genealogical tables, 3 double page genealogical tables, [3 Index] [1 subscribers]. Total 121 leaves.